Throw a Gutterball Gala for your next party! This invitation kit throws a perfect game. Pull the string, and the bowling ball moves up the card to make a strike every time. Includes bowling lane Invitation, ten-pin Name Card, and bowling ball photo Thank You card. 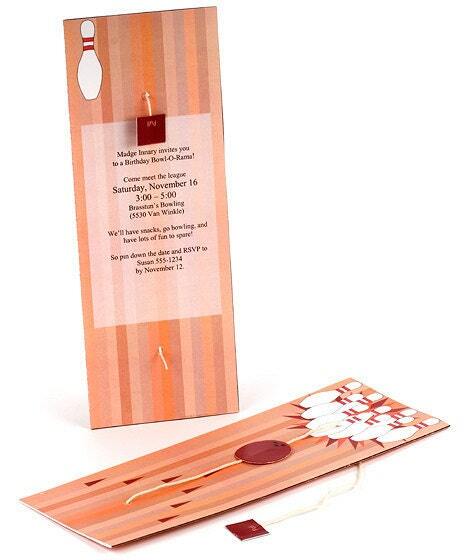 Comes with software to easily print on the invitation, if you like. DIY kit includes all materials (pre-printed paper, string, envelopes) to make invitations, name and thank you cards for 10 guests. Bonus: Good Manners Guide teaches kids basic party etiquette (like how to write the perfect thank you note)! This listing is for an “Eti-Kit”—a DIY kit that comes with software to easily print on the card, or if you like, hand write your invite. Includes all materials: pre-printed paper, CD with instructions and printing template, string, and envelopes. Makes 10 invitations and thank you cards. Great project to make with kids! Need more than 10? Or do you just want a PDF to print our your own DIY pages? Contact me via Etsy. Printable PDF is $5.